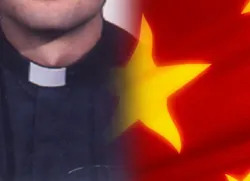 Stamford, Jul 15, 2008 / 02:53 am (CNA).- As the Beijing Olympic Games approach, two priests who tried to attend services for the World Day of Prayer for China on May 24 are still missing after having been detained by the Chinese government. Pope Benedict XVI had announced the day of prayer for May 24, the Feast of Our Lady of Sheshan. Thousands of Chinese pilgrims made a pilgrimage to Sheshan for the event, most of whom doing so with the approval of the Chinese government. Those who did not have government approval risked arrest and detention. All of the underground clergy for the Diocese of Shanghai were placed under house arrest during May to prevent them from making the pilgrimage, the Cardinal Kung Foundation reports. Other underground Catholics were warned not to visit Sheshan on May 24. The Catholic Church in China is split into two different groups: the official communist-controlled Chinese Catholic Patriotic Association and an “underground” Church which remains loyal to the Pope. Efforts to reconcile the two factions have increased under Pope Benedict XVI’s reign and have been amplified by his letter to the Church in China, issued in June of 2007. Two underground priests from the Xuanhua district in the province of Hebei were among the pilgrims that fell victim to the state’s efforts to control the pilgrimage. Father Zhang Jianlin, 42, was intercepted by Chinese authorities in Nanking on his way to Sheshan for the May 24 event. He was sent back to Xuanhua, where he was arrested and detained. Another priest, the 45-year-old Father Zhangli, was arrested and detained a few days before May 24 to prevent his trip to Sheshan. Both priests disappeared while in the custody of Chinese authorities. The Cardinal Kung Foundation says it has no knowledge of their status or location. According to Reuters, police and government offices in Xuanhua District refused to answer questions about the priests or said they had no knowledge of the case. "Nobody would be detained unless they were suspected of violating the law," said an officer from the district public security office who refused to give her name.